Sunquest Vacations has a couple of very last-minute seats from Calgary to to Cancun, Mexico (CUN) that they're selling off for $218 roundtrip after taxes. The flights are operated by Westjet. The price currently verifies when searching for 2 people, but there's only a couple of seats, and once they're gone, there will be an error screen instead. Hope someone out there can use it! UPDATE @ 4:07 PM - The price just dropped even further! It's now down to $169 roundtrip after taxes. Shows higher on the initial page, but drops on the verified price page. 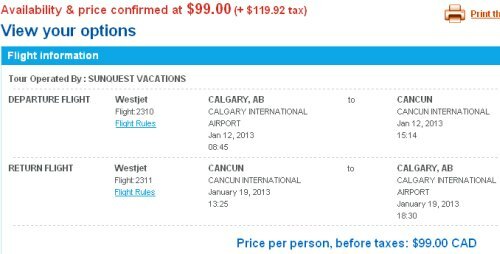 calgary, yyc, flight deals, westjet, mexico, cancun, cun and sunquest vacations.